Through a series of agreements with major and independent ready mixed producers, U.S. Concrete has extended availability of its Aridus Rapid Drying Concrete into Southeast, Midwest and Pacific Northwest markets. Aridus is formulated to prevent floorcovering failures tied to excess moisture vapor in slabs. Developed by subsidiary USC Technologies, the proprietary mix was introduced in U.S. Concrete’s metro New York/New Jersey, Washington, D.C., Texas and northern California ready mixed businesses earlier this year. 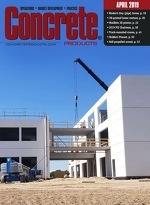 Joining them in the product offering are Bayou Concrete in Gulfport, Miss. ; Cemstone Products in Mendota Heights, Minn.; Irving Materials Inc. in Greenfield, Ind. ; MMC Materials in Madison, Miss. ; Prairie Material Sales, Chicago; and, Stoneway Concrete Inc., Seattle. As licensees, they are granted the right to Aridus mix designs and access to all support materials to produce the concrete at designated plants. “The expansion of our Aridus supplier base through this distinctive group of companies is a great milestone for us to leverage our innovative product solutions, research and development, and quality principles,” said U.S. Concrete CEO William Sandbrook. “We consider this collaboration an advantage for U.S. Concrete to gain access to an extensive national supplier network for Aridus, an expansion of existing business capabilities for our partner companies, as well as an opportunity to continue to bring the latest innovations to the construction industry." The production licensing follows an exclusive Aridus marketing and sales agreement U.S. Concrete inked this spring with below-slab vapor barrier specialist Stego Industries LLC, San Clemente, Calif.